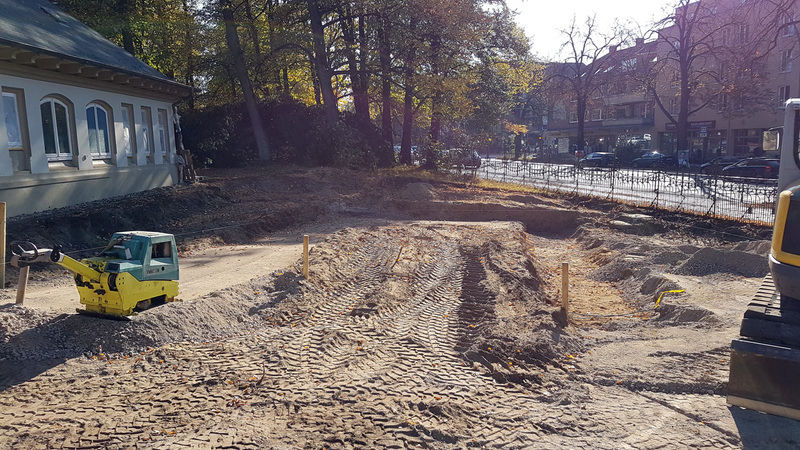 The redevelopment of the main entrance of the Ohlsdorf Cemetery (Friedhof Ohlsdorf) in Hamburg, Germany has begun. We won the competition for this project with our design that reinforces the existing route from the station to the cemetery, creating a visual link between the station square and the entrance areas of the cemetery. The 391 hectares sized Ohlsdorf Cemetery is the biggest park cemetery in the world. The redevelopment of the main entrance at the western side of the cemetery is one of the first interventions in line with the “OHLSDORF 2050” development strategy. The former allure of the entrance area has mainly disappeared due to urban developments in the last century. Hierarchy and coherence between the car and pedestrian entrances have been diluted and the relationship with the adjacent Ohlsdorf station is unclear to pedestrians. We will revitalize the entrance area by implementing a few simple interventions. A carpet of natural stone pavement gives the area cohesion and a clearly recognizable access area. The entrance for pedestrians will be marked by a square with a distinctive seating element. From there the visitor is led to the entrance area on the site of the cemetery.